Leaders of the Scarborough fishermen's group called the attentions of the mainstream media not to twist the news about their plight in the West Philippine Sea because they don't want to back to their previous situation during the Aquino administration. The fishermen who made a living out of the abundance of the Scarborough Shoal areas came from different provinces in Eastern Luzon such as Bataan, Zambales and Pangasinan. 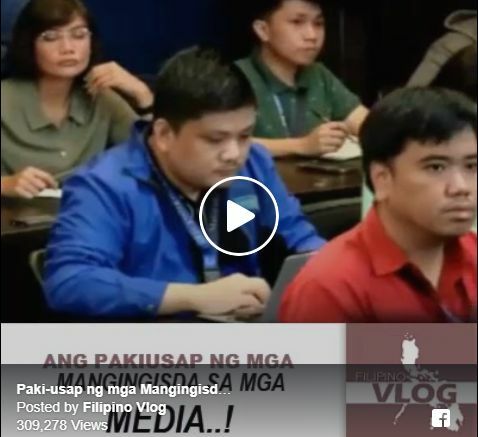 During the press briefing with the Malacanang Press Corps the fishermen who were invited by Presidential Spokesperson Harry Roque admitted that some of their catch were given to the Chinese Coast Guard in exchange for water, cigarettes and other items but they reiterated that they were never harrass by the Chinese patrolling the Scarborough Shoal. One of the fishermen personally asked the mainstream media to be fair and partial with their news report, because they are concerned with their livelihood and they don't want to go back to the time when the Chinese did not allow them to fish in the area of the Scarborough Shoal. The fishermen also recalled that during the administration of former Pres. Noynoy Aquino they were heavily affected with the administration's policy at the Scarborough Shoal because they were not given a chance by the Philippine government to support protect their livelihood. They were always harrassed by the Chinese Coastguard but the situations right now under the Duterte admin were really different.